A nuclear power plant uses nuclear energy for generating electrical power. 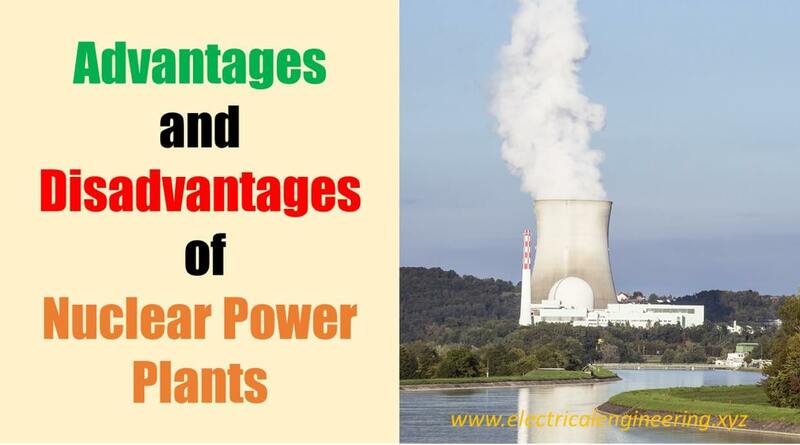 This article presents 10 advantages and disadvantages of the nuclear power plant. Economic base load production: Nuclear power plant is an economic source to be used as a baseload power plant. The running cost is smaller than diesel power plant and comparable with other power plants. Extending availability of fossil fuels: Fossil fuels such as coal and natural gas are continuously depleting. The use of nuclear power plant (NPP) ensures an extending availability of fossil fuels. No greenhouse emissions: Compare to other sources there is very small greenhouse emission. Unlike coal, there is no emission of CO2. Small amount of fuel: Very small amount of nuclear fuel is required for generating a large amount of power. 1 kg of Uranium can generate power as much as 4000 tons of good quality coal. Fuel transportation saving: Smaller quantity of fuel saves from transportation problems. Compact in size: NPP is compact in size. Low running charges: The running charges of NPP are smaller than diesel and off-shore wind resources. Large deposits are available: Large deposits of nuclear power are available that can be utilized for power generation. Reliable source: Sources such as wind, solar are not predictable. The nuclear fuel, on the other hand, is a reliable source for generating power. Can continuously run: A nuclear power can continuously run 95% of the time throughout the year. Capital cost: The capital cost of the nuclear power plant is very high as compared to all other resources. Long approval and commissioning time: A NPP requires very long timescale for approval and commissioning of the plant due to many technical difficulties and safety issues. Accidents: Nuclear accidents associated with nuclear power plants makes it a less acceptable power generation source. Fuel is non-renewable: Use of nuclear fuel ensures extended availability of other nonrenewables, but unlike water, solar, and wind, the nuclear fuel itself is a non-renewable source. Radioactive waste: The nuclear waste is a major trade-off that is associated with nuclear power generation. The assorted waste from an NPP should be stored for 10,000 – 2,00,000 years for safety. Long time scale constructional: NPP requires a long timescale for construction. The crew should be experienced and technical. Nuclear weapons: The use of nuclear for power generation also encourages its use as nuclear power. Net yield: The net energy yield of the nuclear plant is lower. Vulnerable to terrorists: A nuclear power plant is vulnerable to terrorist activities, which requires very strong and tight security measures. Expensive than hydro: The running charges of nuclear fuel is higher than hydro plant furthermore it is nonrenewable as compared to hydroelectricity.